A free book covering the Pygame library for beginner and intermediate Python programmers. Includes the source for 11 game clones including Tetris, Bejewled, Othello, Connect Four, and others. 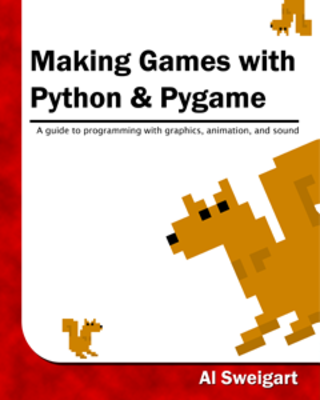 "Making Games with Python & Pygame" is a free book that teaches the reader how to make games with the Pygame library. The book is aimed at beginner and intermediate Python programmers who have the basics of Python but want to start learning how to make games with graphics, animation, and sound. The book features the source code to 11 games. 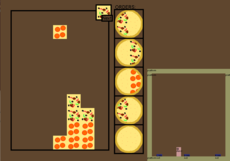 These games are clones of classics such as Nibbles, Tetris, Simon, Bejeweled, Othello, Connect Four, Flood It, and others. The book and the programs are open source, and are available under a Creative Commons Attribution-Noncommercial-Share Alike license, meaning they are free to copy and distribute. A print copy can be bought on Amazon.com for $25. i bought a paperback copy off amazon. Can i get this in pdf form somehow? Yes, here: http://inventwithpython.com/py... - But if you find value buy it to support good work like this! Please help, is the book use Python 2 or Python 3? 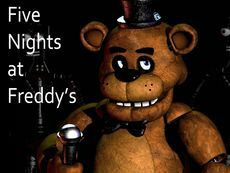 i want to make a 3d graphics game!!!!!!!!!! You know you CAN read the book online for free!